This is how the jars fill up. One by one, when you least expect it. I have described this project as a leap of faith, but it is also defined by the many leaps of generosity and kindness that happen all the time, in the most perfect of ways. The best part about Aleya’s gift wasn’t discovered until after she left. 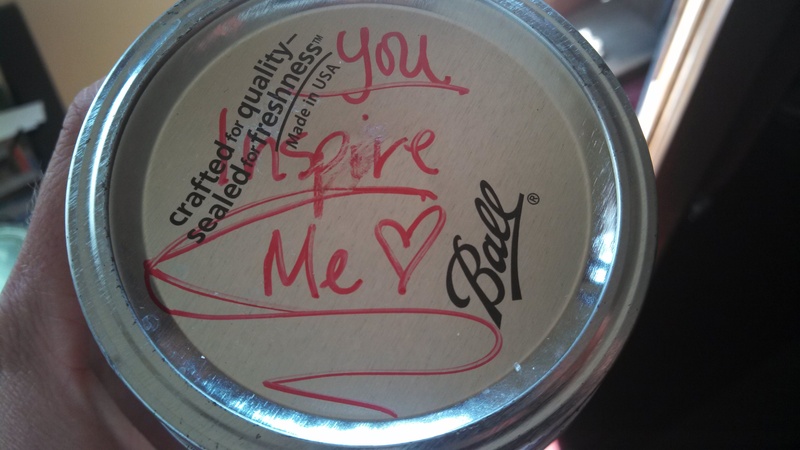 Nothing like a love note on a ball jar lid! These little gifts of sustenance and gratitude have been one of the most profound parts of this eat local experience. We have abandoned convenience and control and opened the door for surprises and miracles. This is not to say that there is not an incredible amount of planning, coordination and intention behind our food life. But, we have also unleashed a new force of unexpected generosity by inviting people into our kitchens through sharing this story. 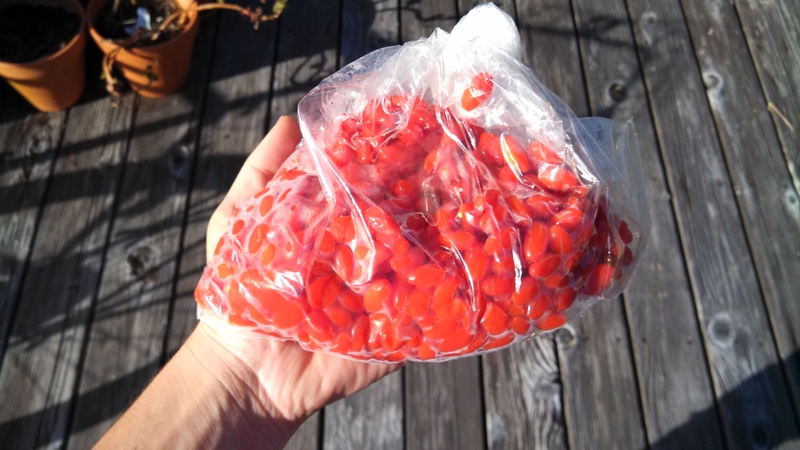 Some of June’s surprises: a fresh-caught fillet of ling cod, a couple pounds of speckled bayo beans and a bag of goji berries grown in Willits! I think these gifts are so touching because food is intimate. We need it to survive, so it reveals our vulnerability and our mortality. What we eat and what we grow and forage also reveals something about our lives. Food reflects culture, history, class, tradition and of course, climate. I stopped by my accountant’s office today and the receptionist exclaimed, “You are famous!” I dismissively laugh at this, but am always delighted when someone wants to talk food. She starts by saying she wouldn’t want to give up cookies, and I assure her that cookies are definitely part of our diet. She also shares that she’s growing peas, and wants to give me some if she has extra. This, too, is how the jars fill up. These food offers always make my heart smile because I know that feeding us is also an endorsement for a new and different food future. One where we talk about food, we share with strangers and we are not so afraid of intimacy. 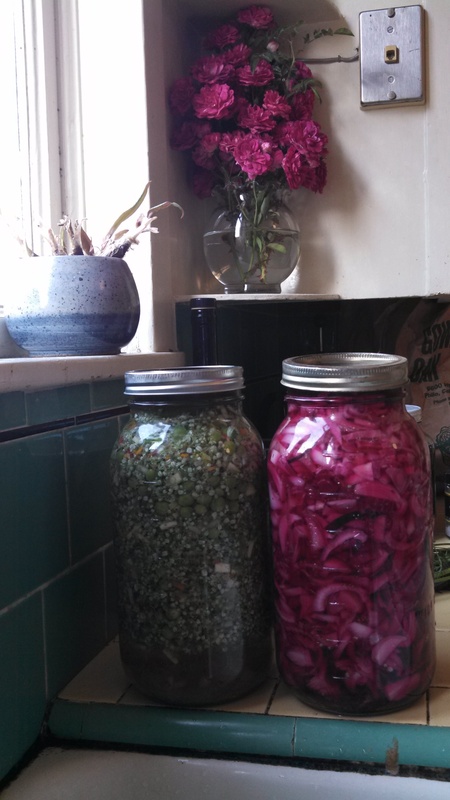 Next I go to Gowan’s, where her jars are full of delicious fermented veggies from her garden. Jar 1 features a green garden medley of onion blossoms, peas, zucchini and red pepper. Jar 2 is sweet red onions and beets. Both are done in a saltwater apple cider vinegar brine. 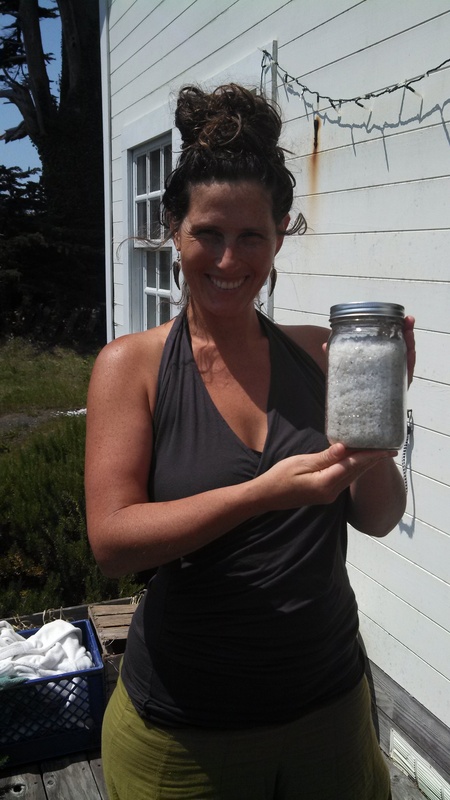 Thanks to Aleya’s salt, the jars will keep filling up. Gowan also has two dozen duck eggs for me, which were graciously transported over the hill from Ukiah by Supervisor Dan Gjerde. How’s that for public service?! Then we go back to my place to feast on a huge pot of those delicious bayo beans and make a batch of candy-cap custard ice cream with roasted bay nuts. We were too excited to photograph the ice cream. Now, we go to bed with full and happy bellies. Thank you to all of you who have helped fill us up. You inspire us. Categories: Food Sourcing | Tags: daily report, Dan Gjerde, eat local, fermented, Food Sourcing, goji berries, mendocino, sea salt | Permalink. Can you pretty please tell me where to look for directions on pickling onions? ….and you inspire me too! I love the Salt Fairy. She’s such an authentic person, and such a light source to be around. They say luck favors the prepared…looks like ya’ll have prepared by building friendships and relationships. So nice to read this post.